Commonly thought of as a bastion of peace and stability in the continent ever since the turn of the century, the southern part of Africa is once more returning to the spotlight of global attention. Zimbabwean officials have alleged that the American and French embassies are behind the latest Color Revolution commotion in the country, stating that their ambassadors even met with the movement’s newest leader, Pastor Evan Mawarire, before he began his campaign. This accusation is echoed by regional leader South Africa, which described the latest tumult as “sponsored elements seeking regime change”. If the US succeeds in its latest Color Revolution plot, then the collapse of Resistant & Defiant Zimbabwe could be the tripwire for automatically setting into motion a preplanned sequence of other destabilizations that might rapidly spread throughout the neighboring countries, thereby returning Southern Africa back to its Cold War-era of conflict and unexpectedly turning it into the New Cold War’s latest battleground. Harare has always been very close to Moscow and especially Beijing, and this trilateral relationship has only intensified in the past couple of years. China openly stated that Africa is a priority area of its foreign policy and that its relationship with the continent is integral to the country’s sustainable 21st-century economic growth. The $4 billion that President Xi promised Zimbabwe during his December 2015 visit there is expected to form the cornerstone of their future relations and yield tangible market benefits for China, all in accordance with its African grand strategy. Russia, just like China, also has many investments in the centrally positioned Southern African state, though they focus more on minerals and military equipment than on the real-sector economy. Still, when taken together in the complementary context of the Russian-Chinese Strategic Partnership, Moscow and Beijing’s combined interests in Zimbabwe have made it an irresistible target for Washington’s covert campaign. More broadly speaking, the region of Southern Africa is internationally known for having the most developed infrastructure networks – a key component of China’s One Belt One Road global vision of connectivity – and a relatively skilled labor force in comparison to the rest of Africa, thus also explaining why many companies rely on this part of the continent as their access point to the rest of it. The high level of physical connectivity between the Southern African states means that people and products can move throughout the lower half of the Southern African Development Community with ease, and while this might be a boon for business, it also inherently carries with it very serious security risks if something goes dangerously wrong in one of these states and insurgent and weapons start moving cross-border instead. Because of the economic importance that many global players attach to Southern Africa – China first and foremost among them – and the real risk that they could all be adversely impacted by the American-directed regime change operation in Zimbabwe, it’s relevant to analyze the situation in depth and prognosticate some of its most likely consequences. Zimbabwe’s economic and political woes aren’t anything new, and their present manifestation is actually the evolution of a years-long policy of hostility that the US has been practicing against it. 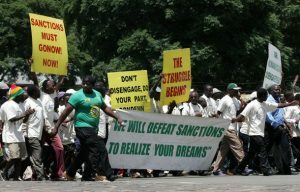 From the implementation of sanctions in the early 2000s to the first Color Revolution attempt in 2008, the US has been persistently trying to undermine President Mugabe for both for the sake of unseating a multipolar leader and because of the regional contagion effect of instability that the Zimbabwean state’s collapse could trigger. Economic warfare against the country was responsible for historic hyperinflation rates of 231 million percent in late-2008, the timing of which was by no means a coincidence. Inflation had been exponentially multiplying in the run-up to the general election in March of that year and the second round that was eventually held in June, and the economic difficulties that Zimbabweans were forced to experience were manufactured by the US in a bid to break the population’s support for the government. “Opposition” rival Morgan Tsvangirai was ultimately unsuccessful in toppling the government, though Mugabe eventually had to concede to a form of ‘Regime Tweaking’ in appointing him as his Prime Minister. This post was specifically created in order to deal with the Color Revolution crisis and was abolished immediately after the American proxy’s term was up, but during that four-year time, the US hoped to use Tsvangirai to weaken the government from within and subvert its sovereignty-exercising plans to integrate Zimbabwe within the emerging multipolar world order. It’s clear that the US has been waging asymmetrical warfare on Zimbabwe for years already, and in fact, many of the lessons that it learned throughout this drawn-out operation have presently been applied to Venezuela as well. Furthermore, the riotous disturbances that are rocking the South American country right now have correspondingly proved to be invaluable lessons for the Color Revolutionaries in Zimbabwe, further demonstrating yet another example of interlinked continuity in the US’ indirect adaptive approach to regime change, or Hybrid War. The latest outbreak of Color Revolution violence was obviously being prepared for a while, but the dual events that prompted its commencement are the signs of an internal power struggle within the ruling ZANU-PF party and Mugabe’s elderly age, with the latter inevitably leading to the former. The President himself has had to address these rumors several times over the past year, chiding his supposed ‘allies’ for already conniving about what they will do once he eventually dies. The popular chatter is that his wife Grace will pick up the reins and carry on her husband’s legacy, but Tsvangirai has already come out against her possible candidacy and is rallying his supporters to oppose her if she chooses to run. With so much political uncertainty in the air, and the economy still in dire straits, the US saw the perfect structural opportunity for asymmetrically striking against the Zimbabwean state and thus revved up its Color Revolutionaries for the coming battle. As it has been wont to do over the past couple of years in undermining targeted governments, the US is employing a syncretic approach in assembling as diverse of a crowd as possible to partake in the Zimbabwean Color Revolution. The figurehead who the US has designed to publicly lead this campaign is Pastor Evan Mawarire, and they purposely chose a religious representative in order to capitalize off of the piousness that pervades the country’s population. Mawarire was just arrested by the authorities for inciting violence, but the US likely foresaw this event and has plenty of backup plans to exploit its proxy’s ‘official’ ‘religious’ position in order to turn him into a Color Revolution martyr behind whom the anti-government crowds and their Western government backers can rally. Relatedly, most of the people who are organizing against the government aren’t doing so for explicitly regime change purposes, but rather to allegedly protest against the country’s deteriorating economic conditions and alleged police violence. Truth be told, they’re likely well aware of how their participation feeds into this scenario, but because they’re not publicly announcing it, they’re able to hide behind a thin veneer of ‘plausible deniability’ when they’re accused of being the US’ “useful idiots’. 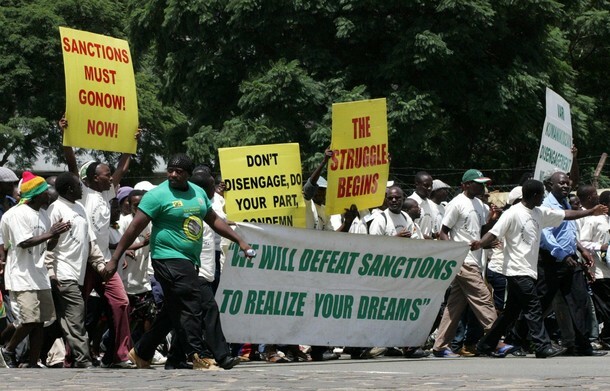 Admittedly, the government itself is responsible for mismanaging part of the country’s economy in response to the US’ disruptive aggression against it, and Mugabe made a major mistake in his 2000 “land reform” package that ultimately ended up destroying Zimbabwe’s agricultural sector, but these incidents in and of themselves should not normally be grounds for launching a violent ‘protest’ movement years after they first occurred. What’s plausibly occurring then isn’t that some Zimbabweans had a years-long delayed reaction to what has happened to their country, but that these ‘protests’ are engineered by the US as the final form of economic warfare against the country designed to push the fragile system past the tipping point and into a tailspin of collapse. “Stay-away day”, as the first themed protest was called at the beginning of the campaign, was more of a nationwide strike than a protest, and it was meant to instantly exacerbate the country’s economic turmoil and grind society to a halt, which would thereby – as the reasoning suggests – attract more dissatisfied people to the street in joining the burgeoning anti-government movement that the Western media would allege had ‘organically’ sprung up in response. Additionally, this sly form of externally triggered economic civil war (the US’ strategic organization of foreign labor strikers against their own targeted economy) also had the unstated ulterior motive of provoking the authorities into a physical response that could then be used to generate intentionally misleading media reports that in turn induceeven more anti-government hostility among the masses and feed the Color Revolution movement. The icing on the cake and the real power multiplier in this entire operation isn’t the Color Revolution figurehead’s religious affiliation or the economic civil war that the US has tried to provoke, but the fact that some respected war veterans from the country’s independence struggle have withdrawn their support for Mugabe and are actively campaigning for his overthrow. They began signaling their discontent earlier this year during a series of government meetings and public statements, but in timed coordination with the Color Revolution that has now broken out, Secretary General of the Zimbabwe National Liberation War Veterans Association (ZNLWVA) Victor Matemadanda proclaimed that “Tsvangirai can be a better enemy because a defined enemy is an enemy you know, but a pretender is much serious, dangerous and can destroy anyone.” He was speaking about the influential G40 faction within the ruling ZANU-PF party that some commentators believe will ascend to power in the wake of Mugabe’s passing, but the salience of his statement is that he is openly plotting to work together with the pro-American ‘opposition’ agent in maneuvering his forces in a post-Mugabe reality. This was preceded by an organizational spokesman voicing support for the Color Revolution, and earlier this year, it’s notable that the veterans were very loud in their opposition to Grace Mugabe and her political allies, obviously positioning themselves as some form of incipient ‘nationalist opposition’ to the government and its leader’s assumed successor. The involvement of the ZNLWVA is very important and shouldn’t be overlooked by any observers. This constituency, however patriotic it may be, essentially represents an informal ally of the US in weakening popular support for the Mugabe Administration. There’s no objection being raised to the organic development of a patriotic opposition to the government, but it’s just that the ZNLWVA appears to be inadvertently furthering the exact same objective as the US at this moment, which is the diminishment of civil trust in the government and the promotion of a regime change agenda. There’s likely no contact between American intelligence agencies and this group, and they’d probably immediately reject any outreaches that could be or might have already been made, but the case of ZNLWVA proves that even presumably well intentioned patriotic organizations could unwittingly function as “useful idiots” in lending ‘legitimacy’ to the US’ preplanned scheme, mostly in the pursuit of their own narrow self-interests but possibly also out of the conspiratorial actions of some of its co-opted members. ZNLWVA’s partisanship on the side of the Color Revolutionaries is also meant to exert influence on the military and security forces who might understandably be reluctant to forcibly respond to “their own” if the government orders them to disband the riotous disturbances. The underlying purpose of the veterans’ group is to form the core of a “patriotic-nationalist” opposition against Mugabe that could attract current servicemen and trigger defections, thus weakening the make-or-break powerbrokers that could hold the most control during the uncertain post-Mugabe transitional period (whether he dies or is overthrown). Andrew Korybko is the American political commentator currently working for the Sputnik agency. He is the post-graduate of the MGIMO University and author of the monograph “Hybrid Wars: The Indirect Adaptive Approach To Regime Change” (2015). This text will be included into his forthcoming book on the theory of Hybrid Warfare. Each of the three forces described above have their own specific uses in the US’ destabilization template against Zimbabwe, but on their own, they’re insufficient to produce the desired result. Therefore, the US has consolidated them together via the Color Revolution coordination mechanism and is indirectly multi-managing their activities for maximum effect. Mawarire is the media-friendly face of the Color Revolution and the ‘bait’ for attracting faith-based individuals out into the street. His predictable arrest means that he’ll become a global “democracy” icon in the coming weeks and be exploited by hostile Western governments as part of their information warfare operations against Mugabe. The more successful that Mawarire’s ‘martyrdom’ and the corresponding Western media aggression around it are, the more probable it is that masses of people will flood into the streets and join his Color Revolution, thus intensifying the economic civil war by grinding the capital’s commerce to a halt. In response to expected provocations on the side of the “opposition”, the military and related security forces will probably be ordered to disband the anti-government manifestations, but they might be hesitant to do so if this means that they must clash with the respected ZNLWVA veterans. Even if they faithfully carry out their duties, the Western media-manipulated and decontextualized image of young soldiers/police arresting independence-era veterans or forcible defending themselves from their attacks (“an unprovoked assault on democratic protesters”, in Western parlance) could be enough to push segments of society over the edge and into violent insurgency against the government. Some servicemen might join them out of ‘solidarity’ with their ‘fellow soldiers’, which could damage the military’s unity and significantly increase the capacities of the anti-government guerrillas in any forthcoming Unconventional War, whether waged in the urban areas, the rural ones, or both. Even though it seems like Color Revolution veteran and “opposition” leader Tsvangirai is the man who the US intends to replace Mugabe, chances are that his only real purpose would be to serve as a temporary placeholder until someone more suitable is chosen, whether out of the ‘opposition’ ranks or as a co-opted politician from the ruling party. This forecast isn’t just speculation, though, because it’s already been confirmed by the politician himself that he’s suffering from colon cancer, which caused his intra-party rivals to right away demand that he resign due to his health concerns. He probably won’t do that until the Color Revolution ends, whether with him sitting in power or in a jail cell, because the US understands that the misled portions of the Zimbabwean citizenry which are actively supporting him need a familiar and “trusted” face to rely on during this time. Mawarire the pastor is only useful for being a symbol of resistance and for his potentially magnetic pull among the religious community, whereas it’s Tsvangirai whom the agitated masses and their ZNLWVA allies expect to lead them after Mugabe’s possible fall. There’s of course a chance that this politician would remain in office if he and his covert American backers are successful in overthrowing the Zimbabwe’s President, but the cloak-and-dagger nature of the country’s politics (whether among the ruling party or the ‘opposition’) means that it can’t fully be discounted that he’ll be pushed out by his own allies with time. The fact that intra-organizational pressure was already building on the cusp of the Color Revolution’s commencement proves just how disunited the US’ main proxy network in the country really is, but if Tsvangirai finds a way to fend them off or reach some sort of secret agreement for a future power transfer once he’s in office, they might end up rallying behind him with increased passion and effectiveness. For now, though, one shouldn’t dismiss the theory that Tsvangirai is just a placeholder for an unnamed (and possibly yet-to-be-designated) politician who could end up replacing him (whether voluntarily, through intra-party manipulation, or by force) shortly after he seizes power. Zimbabwe might come off as a unified country with a strong sense of patriotism, but beneath the surface hangs the disturbing prospect of ethnic tensions exploding between its two largest identity groups, the Shona and the Ndebele. The Shona represent the vast bulk of Zimbabwe’s population at around 80%, while the Ndebele constitute most of the remaining 20%. Mugabe is a Shona, and his pro-Soviet Zimbabwean African National Union (ZANU) was composed mostly of his fellow tribesmen who largely operated out of their northern homeland during the Independence War, while his rival revolutionaries, the pro-Chinese Zimbabwean African People’s Union (ZAPU) led by Joshua Nkomo, had a large Ndebele component and were mostly active in their own western homeland. After the end of white minority rule and Mugabe’s election in 1980, ZANU cracked down on their ZAPU competitors, accusing them of orchestrating a counter-revolution and behaving as subversive elements. The campaign that followed was termed “Gukurahundi” and it inevitably heavy with the ethnic overtones of the Shona-led ZANU government militarily responding to members of the Ndebele ZAPU opposition. The two sides reconciled in 1987 after ZAPU agreed to disarm and integrate into ZANU, thus forming the Zimbabwean African National Union – Patriotic Front (ZANU-PF) that has gone on to rule to this day. The possible scenario of a united Zimbabwe torn apart by Hybrid War dates back to these identity divisions, and there’s a chance that they could return to the fore of the national dialogue, whether this occurs ‘organically’ or through external guidance (potentially with the US utilizing friendly information outlets and/or NGOs). Increasing the attractiveness that foreign actors might have in promoting this plan of civil conflict is the fact that there’s a clear-cut geographical distinction between the two groups. Even though the Ndebele are only about 20% of the population, their traditional homeland of Matabeleland and common area of present habitation accounts for about 33% of the country’s total territory in the western regions. Likewise, the Shona, who are estimated to be nearly 80% of the population, have a traditional homeland of Mashonaland that takes up around 30% of the northern corner of Zimbabwe (though many also live outside of it). Even though there’s an intermingling of these two populations all across the country, the political-administrative divisions expressed above are typically taken as expressing each group’s respective home territory. The most sparsely and least settled parts of Zimbabwe are in Matabeleland, with the bulk of the country’s citizens living in the central, northern, and eastern reaches of the state. Still, Zimbabwe’s second-largest city of Bulawayo is located in the historically Ndebele-inhabited area of the country, thus proving that this region is certainly relevant to the state’s social framework despite its comparatively smaller total population. Taking into consideration these geo-demographic factors, it’s not unforeseeable that a militant autonomy or secessionist movement might take root in Matabeleland amidst any chaotic circumstances that arise from a Zimbabwean Color Revolution. The outbreak of Hybrid War in the country could unleash the same sort of ethnic tensions between the Shona and Ndebele as the civil war in South Sudan did with the Dinka and Nuer, all to the benefit of an external actor that either prods this scenario on in the first place or craftily exploits it to its own geostrategic advantage. 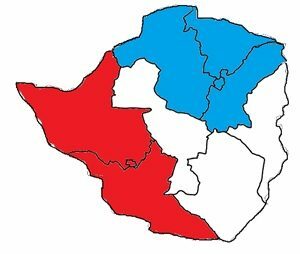 The promulgation of Identity Federalism in Zimbabwe as a “solution” to this scenario would make the erstwhile unified whole much more easier to control, while an independent Matabeleland could become a pro-American regional base, bearing in mind how the US’ often uses minority populations and newly created weak separatist states as its geostrategic proxies. Zimbabwe’s descent into a bloody Hybrid War, complete with anti-government insurgency and ethnic killings, would have serious implications for stability all across the Southern African region. All four of the country’s neighbors would be directly affected by the Weapons of Mass Migration that would be unleashed in the aftermath, as well as by the presence of a failed state adjacent to their borders. This historically anti-colonial Southern African state is at risk of experiencing its own Hybrid War even without the destabilizing push that a state collapse in Zimbabwe could give it. A general election will be held on 11 August, and incumbent President Lungu is already facing Color Revolution pressure. Recent clashes and the death of an opposition supporter prompted him to suspend the country’s election campaigning for 10 days, and the violence that broke out coincidentally came on the heels of sharp American criticism against his government. The authorities shut down “The Post”, the largest opposition newspaper, late last month on charges that it had run up $6 million in unpaid taxes. The US saw this as an ‘attack on free speech’ and harshly condemned Lungu for ‘silencing the opposition’, demanding that he allow the tax-evading outlet to reopen as soon as possible. Not only did he refuse to do so, but he even cancelled a meeting with the US Assistant Secretary for African affairs. This ‘audacious’ act of independence couldn’t have gone unpunished for long, and it was only just a week later that the ‘opposition’ stoked pre-election violence all across the country in their desperate bid to stir up anti-government unrest. Lungu isn’t being targeted solely because of his refusal to bow down before the US’ unipolar dictates, though that’s certainly a large part of why Washington is so angry at him. His country, Zambia, is a decades-long mineral-rich partner of China, and Beijing actually built the TAZARA railway through neighboringTanzania in the 1970s as a means of linking together the three partnered states. 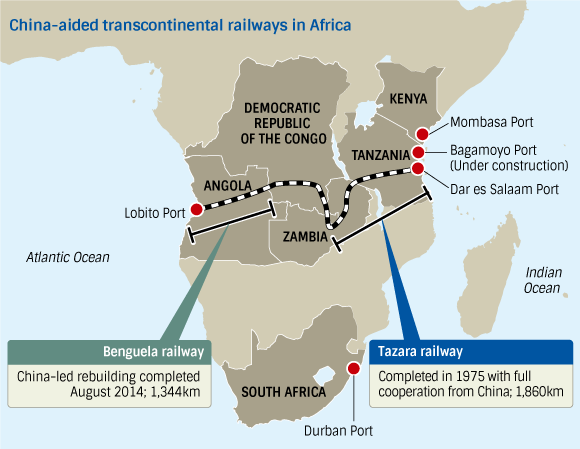 This close strategic relationship continued in the post-Cold War era, and one could even make the case that the success of TAZARA laid the foundation for China’s future One Belt One Road worldwide policy of infrastructure connectivity, seeing as how it was the first prominent such project that Beijing ever commenced. Nowadays, the Zambian portion of TAZARA is an irreplaceably valuable investment in completing China’s African Silk Road vision of bridging the continent’s Indian and Atlantic coasts. TAZARA is planned to be expanded westward through the North West Railway project that will bring it to the Angolan border, from where it will join up with the recently Chinese-refurbished Benguela Railway and eventually reach the Atlantic Ocean. In this manner, the Tanzanian Indian Ocean Coast and the Angolan Atlantic one would be connected via their commonly adjacent landlocked Zambian neighbor. Even though there’s a chance of an alternative route going through Zambia to the southern Democratic Republic of the Congo’s region of Katanga, the trilateral Tanzania-Zambia-Angola path seems to be much more reliable due to the serious Hybrid War pressures afflicting Africa’s second-largest country, which was also the scene of the continent’s deadliest war that claimed at least 5 million lives in the 1990s and which still hasn’t been internally resolved in full. Even so, the Zambian route isn’t exactly problem-free either, with the western part of the country being the scene of “Barotseland” disturbances. This scarcely populated territory through which the North West Railway must pass en route to Angola has a complex history with the state, but the general idea is that it was promised some sort of federal-autonomous arrangement around the time of Zambia’s independence, but which was shortly thereafter controversially revoked by Lusaka. “Barotseland” protesters have pulled off their mission to once more make this issue a nationwide topic of discussion, and some are even trying to pair it with the government’s 2013 decentralization policy in order to suggest a federalized “solution” to this re-emerging problem. Just like with Zimbabwe or any other country that implements any form of Identity Federalism, Zambia’s federal future would be rife with internal discord driven by external manipulation. In accordance with the Law Of Hybrid War, the end goal of this would be to disrupt, influence, or control China’s multipolar transnational connective infrastructure project of the Southern Transcontinental African Route (TAZARA + North West Railway + Benguela) by making its essential middle component hostage to the developing American-influenced political situation in the country. Whether it’s a Color Revolution in the capital, an Unconventional War in “Barotseland”, or a composite Hybrid War throughout all of the country, Zambia is certainly vulnerable to a range of destabilizations, and it might just take the US-orchestrated collapse of Zimbabwe and the resultant inflow of Weapons of Mass Migration to push the country over the edge and catalyze these dark scenarios. These two neighboring countries are expected to be less directly impacted by any successful Hybrid War in Zimbabwe, though they’ll nevertheless still have their domestic stabilities offset to a certain degree. It’s unclear at this point just how much Botswana would be affected, but it’s a fair to say that it would be compelled to set up emergency refugee facilities along its extended eastern border with its neighbor. It should be reminded that Botswana only has slightly over 2 million people, a quarter of which are estimated to be concentrated around the capital of Gaborone in the southeast. Around 150,000 people also live in the Zimbabwean-bordering town and second-largest settlement of Francistown, so because of its proximity to the area of projected conflict, it’s expected that this city would become the country’s frontline defense in guarding against and responding to Weapons of Mass Migration. Depending on the scale of inflow, Botswana might not be able to fully control its borders, in which case anti-government insurgents might capitalize off of the situation in order to infiltrate the country and set up a network of safe havens. Even though this possibility presently seems remote, in analyzing the residual effects of a Zimbabwean Hybrid War on the region, it can’t responsibly be discounted by any strategist. On a related note, if this happens, then it could be used to ‘justify’ the US’ reported plans to open up an AFRICOM airbase in the southern part of the country, and these prospective regional crises might even be engineered partially on the motive of doing so. Mozambique stands to be even more drastically impacted than Botswana, mostly because of the simmering conflict that’s re-emerged in that country ever since it discovered some of the world’s largest LNG deposits a few years ago. RENAMO, the Cold War-era rebel group that the US supported in the post-independence Mozambican Civil War, returned to low-scale militancy in 2013. Referred to as the country’s “invisible civil war” ever since, the conflict has persistently remained a challenge that just won’t abate. While there’s no direct evidence to prove it yet, if one understands the US’ global energy imperatives of controlling or denying various resources to others, as well as the CIA’s decades-long documented connection with RENAMO, it’s not at all unreasonable to suggest that the latest violence is being provoked by Washington as a means of interfering with Maputo’s LNG future. It’s predictable that this conflict will eventually intensify the closer that Mozambique comes to exporting its LNG on the global market, but in the meantime, any Weapons of Mass Migration streaming in from a Hybrid War-afflicted Zimbabwe (whether refugees or insurgents) could create a serious domestic crisis in RENAMO’s traditional western borderland area of operations. The government’s response to this prospective set of problems could either ‘naturally’ aggravate the conflict with RENAMO or be manipulated in such a way by self-interested internal actors and/or their external handlers for this end. Washington ideally hoped that South African President Zuma would have already been deposed by a ‘constitutional coup’ by now and that his country could be the ‘Lead From Behind’ springboard for guaranteeing that the anti-Mugabe mission succeeded, but since he defied the odds and survived the plot earlier this year (unlike his BRICS counterpart Dilma Rousseff), it’s likely that the US intends to target him once again almost immediately after toppling Mugabe. In fact, South Africa has always been the regional crown jewel for American regime change planners, and it’s not unlikely that everything that’s going on in Zimbabwe right now is purposely aimed at eventually destabilizing its southern BRICS neighbor. For the moment at least, South Africa is still in a position to render supportive assistance to its anti-apartheid ally (however limited and/or symbolic it may be), but this could abruptly stop if the liberal Soros-funded “Democratic Alliance” ‘opposition’ pulls off an impressive showing during the 3 August nationwide local elections and expands their power over the rest of the remaining major cities that are still outside of their control, which is what some observers are expecting. A ruling ANC party spokesman accused the US of fomenting regime change earlier this year, and even though Zuma ‘dodged a bullet’ with his impeachment case, it doesn’t mean that there isn’t a ‘Plan B’ for the US to fall back on and that a Zimbabwean Hybrid War concurrent with the upcoming local elections isn’t part of it. The political future of the President and his ANC party are in doubt because of some serious economic and domestic mishandlings, so it’s entirely possible that the pro-American ‘opposition’ will gain some extra support in the next electoral round and gradually strengthen their influence in the country, much to Zuma and his multipolar BRICS partners’ expected expense. With the ‘opposition’ gaining ground and working hand-in-hand with the US’ allied information outlets to craft the perception that they’re on the inevitable ascent to full power, the “Democratic Alliance” can be in a much better position to popularize the concept of Identity Federalism if an out-of-control Zimbabwean Hybrid War destructively spills across the border and produces the conditions for its advancement. 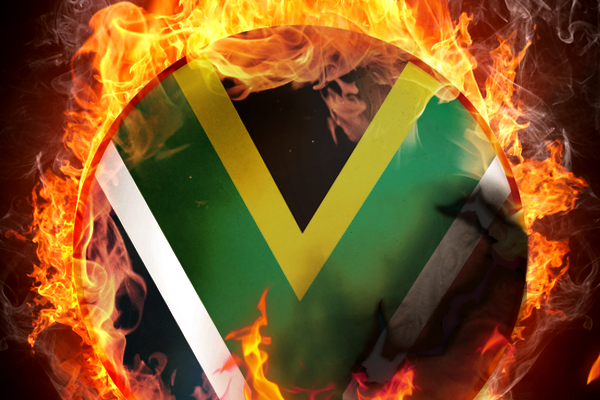 The BRICS stalwart of South Africa is existentially threatened by the danger that Weapons of Mass Migration could spark the unitary republic’s dissolution into a collection of quasi-independent tribal/ethnic-based federal statelets. Not only are visible segments of South African society violently xenophobic against the influx of African migrant workers that have flooded into the economically promising state over the past two decades, but there are even deep undercurrents of extremely polarized tension among its native peoples. 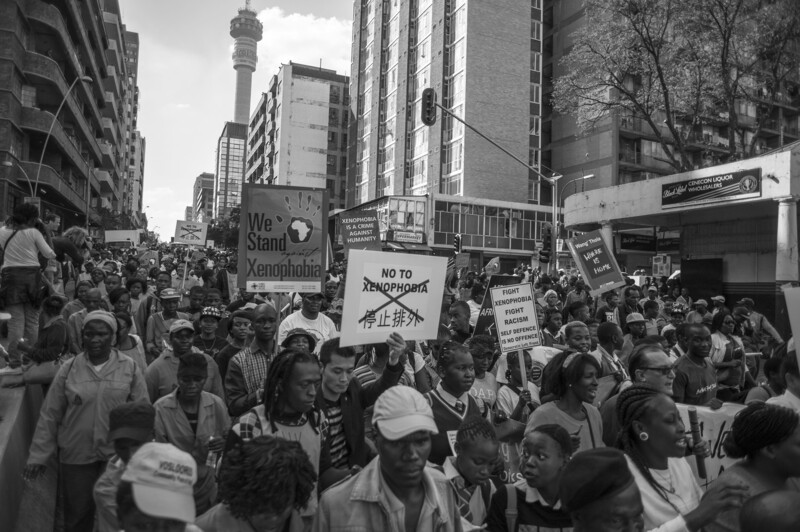 Zulu nationalism was blamed for the xenophobic riots of early 2015, and the failure of South Africa to transcend identity-centric politics poses a very real threat to all other ethnicities within the country such as the Xhosa and Basotho, for example, whether they’re killing one another or fighting within their own groups. Without the shared enemy of apartheid to unite the country’s disparate range of ethnic-tribal identities, it regretfully looks like some of these groups are at a serious risk of “self-segregating” and dividing the country along their identity lines. Tribalism has always been a civilizational vulnerability for the sub-Saharan African peoples just as sectarianism has been for the Muslim ones, and the rich spectrum of South Africa’s countless diverse identities could be violently divided against one another by external manipulation even easier than the binary Sunni-Shia split was savagely masterminded over recent years. All that it might take to produce this American-anticipated reaction is the large-scale introduction of Weapons of Mass Migration to set off an uncontrollable spate of deadly xenophobic purges that quickly spiral to the point of all-out civil war between the native ethnicities, eventually resulting in the de-facto re-institutionalization of “Bantustans” via the ‘politically correct’ and ‘domestically asked-for’ ‘black-led’ ‘solution’ of Identity Federalism. Zimbabwe is at its most vulnerable and weakest point since independence, having been financially ravaged into economic destitution by the US and now on the cusp of descending into a dangerous spiral of Hybrid War violence. The government still has the chance to restore order and prevent the regime change riots from spreading, but it persuasively looks as though it’s at its closest that it’s ever been to state failure. The economy is in doldrums, unemployment is rampant, and people are upset at the authorities for a host of reasons, many of which are actually legitimate and in one way or another directly attributable to the actions of the ruling ZANU-PF party. Nevertheless, the timing of the most recent disturbances coincides with a rumored successionist struggle and the political technologies involved in the ‘protests’ almost exactly replicate those of previous Color Revolutions, so it’s a fair to analytically conclude that the US is launching yet another regime change plot against President Mugabe in order to unbalance Zimbabwe at its most uncertain moment and capitalize off of the strategic run-up to its leader’s inevitable passing. If the US even moderately succeeds in the latest iteration of its Hybrid War campaign, then it could have disastrous consequences for the rest of the Southern African region, spewing Weapons of Mass Migration and other destabilizations at all its fragile neighbors and possibly returning this part of the continent back to its Cold War-ear roots as a frontline geopolitical battlefield. THE THREE AGES OF THE INTERIOR LIFE Prelude of Eternal Life by Reginald Garrigou-Lagrange, O.P.